Hi and Happy Tuesday. Today’s Photography 101 is Glass. 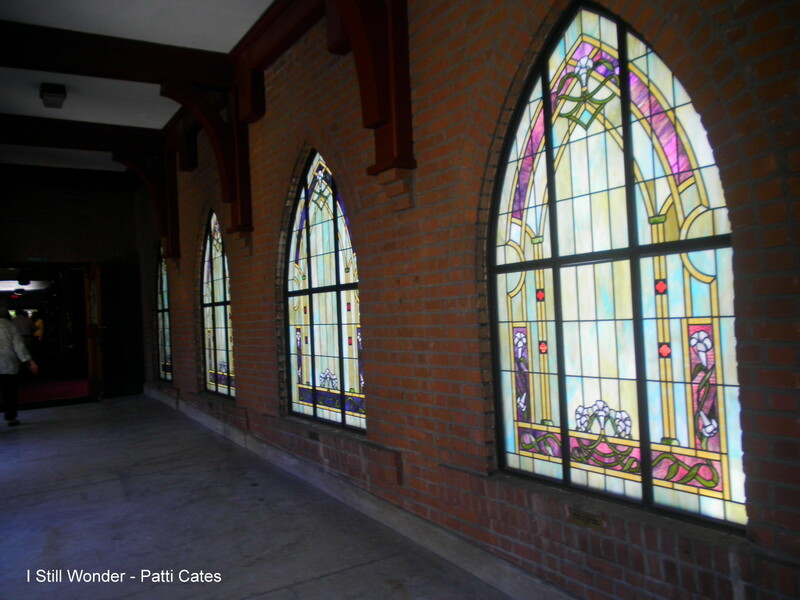 I decided to include two photos of stained glass since I think those are so pretty. The first photo is in the breezeway between the sanctuary and outdoor patio and rooms at my grandparent’s church in San Diego, California. This is a special place where the family would gather. The second picture is of the place where my other set of grandparents met – in Hendersonville, North Carolina. We visited that during the summer this year. It was quite special to be there and see where it all began. It is amazing to me how similar the shapes are of the windows at the two churches. It must be a common design. Unfortunately these photos don’t do these windows justice. They are so much prettier in person. I have always liked stained glass windows. The church where Kirk and I met and got married also has stained glass in the windows of both the sanctuary and the narthex. 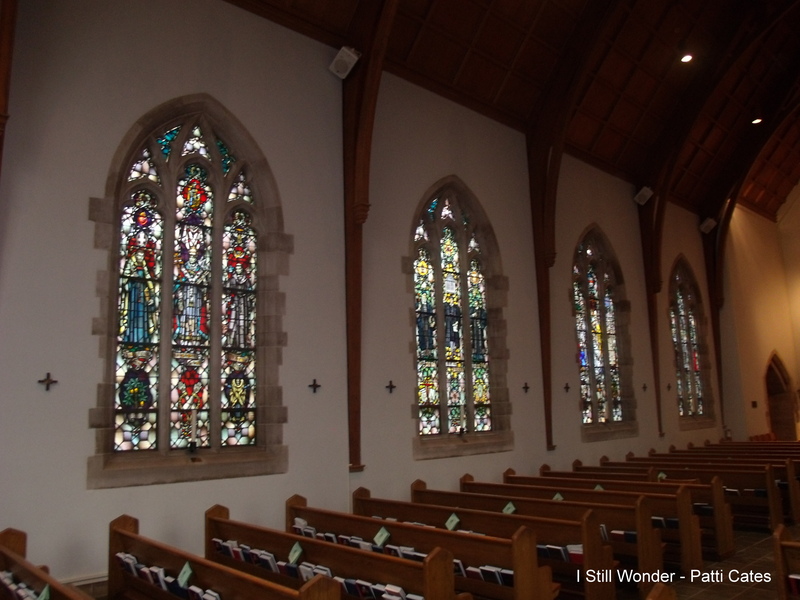 I wonder when I will get to see another lovely stained glass window? Very soon I imagine. Have a great day! Today’s Photography 101 word is Treasure. Normally we think of treasure as gold and valuables, but treasure also is who and what we truly value and love. My treasure is my family, friends, and the memories we make and share. The house that I have chosen for today is one of the places where four generations of my family have had fun and have enjoyed being together. This is the family beach house and it is a wonderful place to gather. It is a definite treasure. 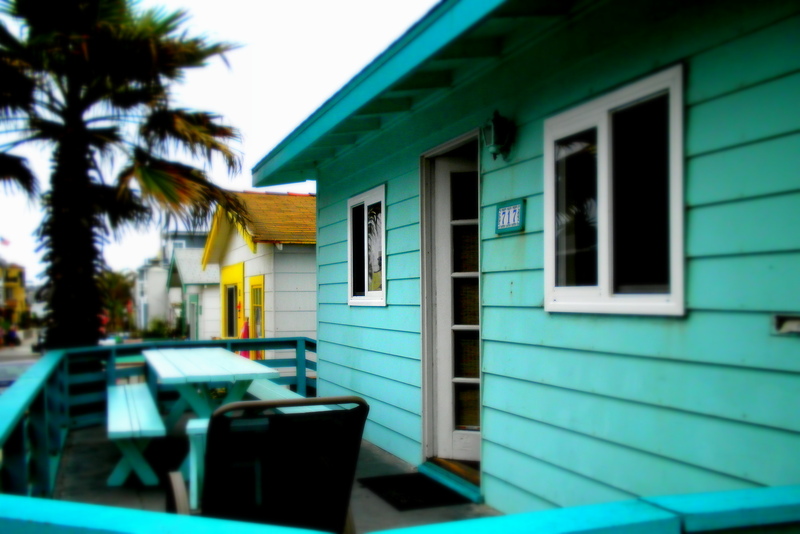 I love the turquoise color, love the front porch where hundreds of meals have been served, and love the doors and windows, which are opened and let the ocean breeze in. I also love the table and benches that a friend built for us, the ramp down the side of the house which leads to the outdoor shower and patio, and the gate which Ian clung to as he was first learning to walk. I also love the family sing-alongs around the piano, love when we pack people in to spend the night, love taking turns making meals, love playing games and talking late into the night on the porch, love eating fish tacos from a restaurant that we can walk to, love the back patio crowded with all of the bikes, love the towels and sunscreen all over the front and back porches, and love to watch all of the beach and boardwalk activity. It may seem like an odd choice for treasure. But, this place is very special to me. It doesn’t look like much, but every square inch is filled with memories and fun with my dear friends and family. I am so blessed to have had this place to come to throughout my life. And, from the porch, if you look to the left, you can see the lovely pacific ocean and sand. To the right is the bay on the other side of a major street. 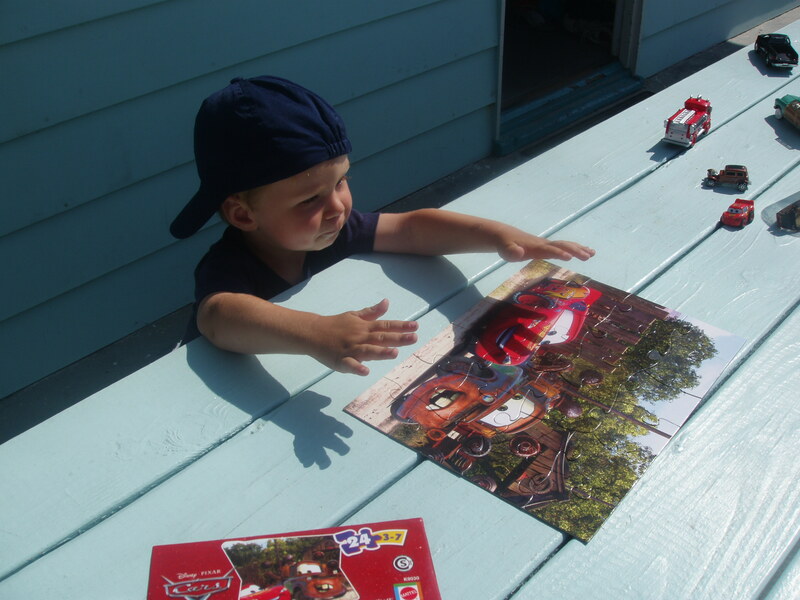 Here is Ian just finishing his puzzle a few years ago on the porch table. He was also having fun with his cars. We traveled with him to this house for the first five years of his life. Each year he enjoyed something new and had blast, just as I did. That is an amazing treasure and a wonderful blessing. Here is a photo of when I was a child on this same porch. I am sitting with my parents. The wooden table hadn’t been built yet when this was taken. As you can see the color of the gate is different, cars on the street are different, but the fun of the place is still there. That fun has simply grown as my husband and I, and my parents, siblings, cousins, aunts and uncles have grown and have wanted to bring new family members to enjoy the fun. This tiny house is treasure to me and is a place I love to visit. I wonder when I will next get to visit my treasured place? I hope that it will be very soon! Hi and happy Friday! 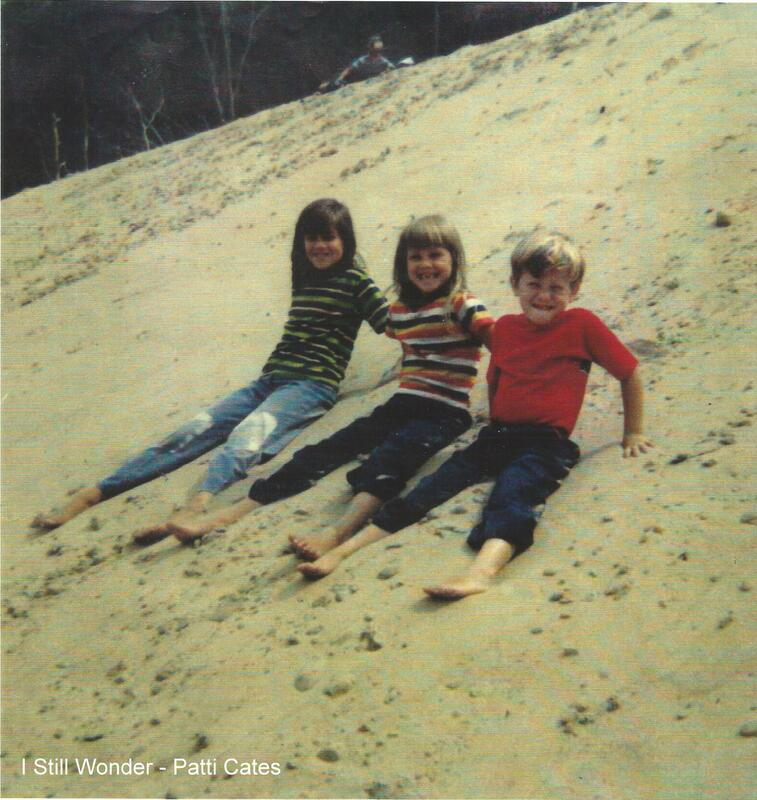 For today’s Flashback Friday, I decided to post a photo of my sister, my brother, and me with our bare feet on a sand dune circa late 1970s / early 1980s. I like our big grins, bare feet, and hands in the sand. With all of the cold weather this week, this photo made me happy. And warm. I also like our striped shirts, the patches on my jeans, and that all of our jeans are riding up as we sit in the nice warm sand. This particular trip was somewhere in Michigan at the dunes. We enjoyed them and were fascinated with this different sand than we were used to. This photo was taken while we were visiting friends and family. We had a great time. During this trip we also went to a plant where they packaged cereal. I still vividly remember recreating the process in our friend’s basement after seeing the professionals at work. I have many fond memories of growing up with these two. 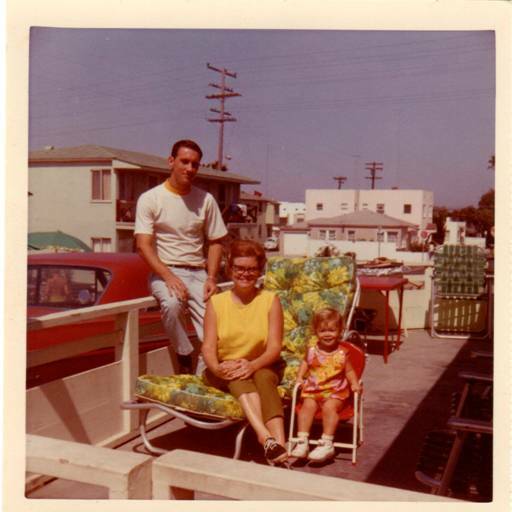 Our parents were great about taking us to a variety of towns and cities throughout the country. We also enjoyed many camping trips. I am at left in the photo, Cindy is in the middle, and Richmond is on the right. I wonder what the next adventures will be with my sister and brother and with our parents? I cannot wait to find out and love that our spouses and children will be there to enjoy the adventures with us! Three generations will be even more fun! Life is full of amazing moments. Both good ones and bad. Today’s Photography 101 prompt is Moment. I thought this picture would work nicely for that. I took it several years ago of Ian at the beach. It is one of the first times he was able to stand in the ocean by himself without getting knocked over. I love how he is watching the water rush over his feet as the waves go in and out. He was fascinated with the speed of the water, the feel of the waves and the squishy sand. I loved watching this learnable moment. He has come to love the ocean, the waves, the sand, and all of the amazing colors of the water as much as I have. Ian has helped me to live in the moment and savor each activity or project that I am working on. He is very good about living life to the fullest and making the most of each moment. Kirk and I have learned a lot from him and continue to do so. I wonder if I can remember to make the most of each and every moment that I have. I plan to do just that. To making each moment count!! Hi and Happy Monday! It is time for some major changes in my life. I mean weight loss changes, and improving my health. I am so over the size that I am, so I have to change. I have to change what and how much I eat, and I have to change my exercise or lack thereof. Time to eat better, time to exercise, and time to stop making excuses. In recent pictures of myself, I don’t like how I look. “Where did that double chin come from?” I asked myself. And, “how did I get to be this size?” Or “Is it my clothes that make me look fat?” Sadly no, it’s not the clothes. So, it is the time I realized that and moved on with weight loss 2.0. I can no longer deny that something needs to be done. But isn’t it funny that we make excuses to ourselves until we are truly ready to make the changes that are necessary in our lives? I have been making them for a while. In order to get better, I have to stop that. Starting today. Several times in my life I have had to work hard to lose weight. I am not a person who can do it easily and that in itself is frustrating. 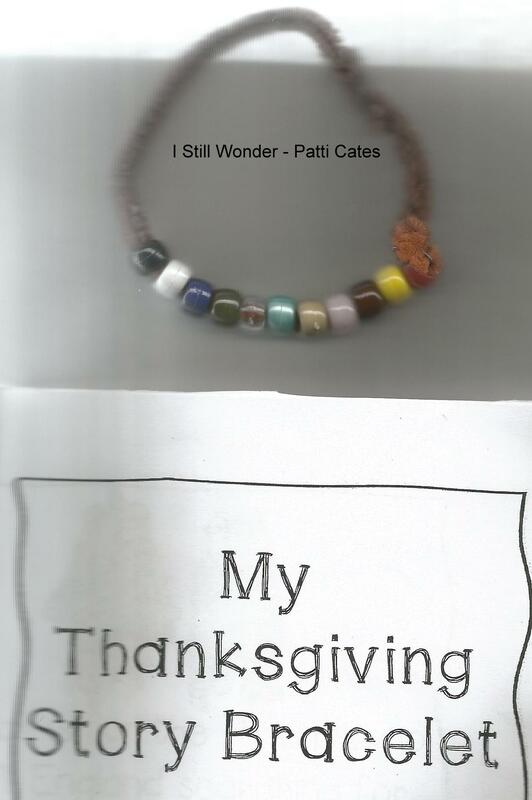 I am on several medications for health issues and would like to stop taking those. My doctor has told me that losing weight will help. He also said that exercise is important, but it boils down to what you put in your mouth. I have a great appetite and love to eat. Sometimes I just eat entirely too much food. My cousin gave me a great idea of using smaller plates and that if the food isn’t in the house, it won’t be a temptation. She is right. Before getting pregnant with Ian, I was very successful with losing weight and then maintained it for quite a while. I was careful with my salt intake and exercised every day. Knowing that I have had success in the past is very helpful and something I will pat myself on the back about. And I can draw on that for strength. My cousin also said it is in your mind. If I determine and decide to do this, I can. I have to take care of myself and realize that my health is important. So, I will schedule exercise time on my calendar and plan the meals carefully. Even though these seem like little things, they are big and very important to maintaining a healthy lifestyle. That is the key – not to think of this as a diet but my new lifestyle. Here is an interesting quote on losing weight: Elizabeth Berg said, “Nothing tastes as good as being thin feels.” I am not quite there since I truly love food. And, I still want to have some treats so I am not feeling deprived. I just have to figure out healthier ways to eat those favorite items. And, each day, I need to be active and exercise. 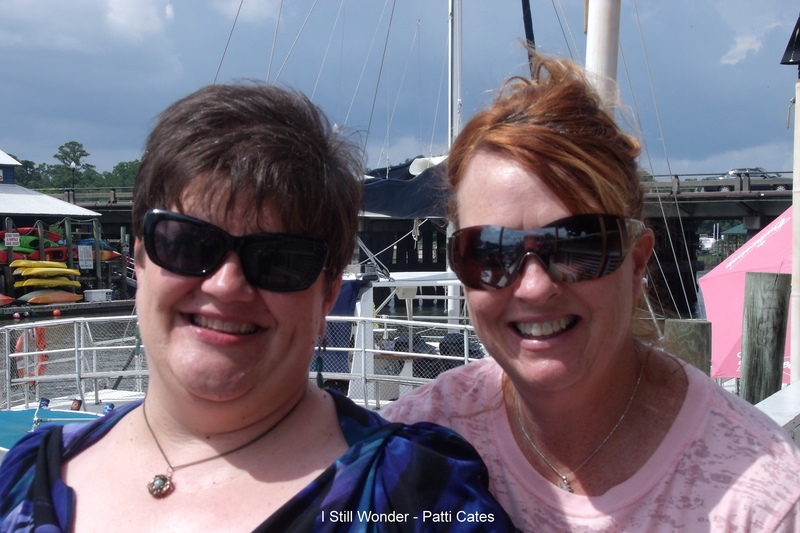 I am fortunate that my hubby and other family members love me no matter what size I am. 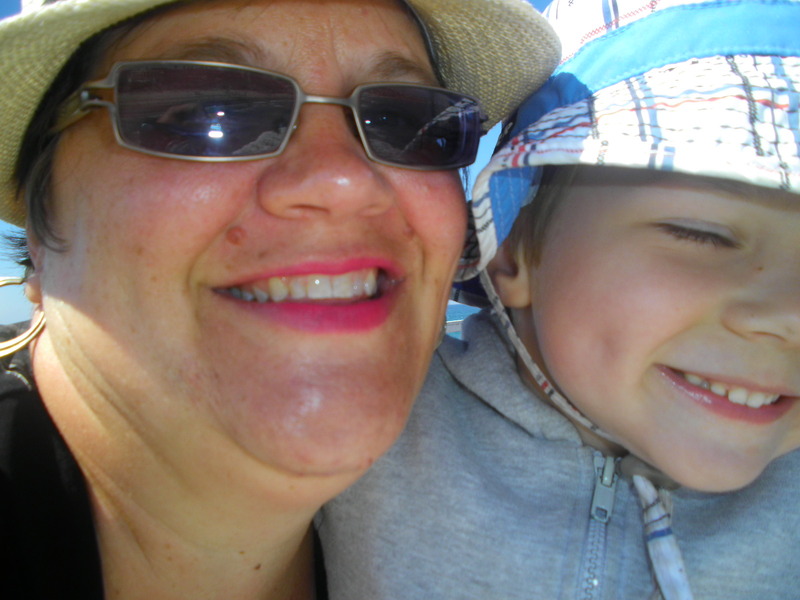 And, my son thinks I am beautiful, which means the world to me. And, they all want me to be healthy, so here’s to the journey. I will keep you posted on how things are going. Any ideas or words of encouragement would be greatly appreciated! 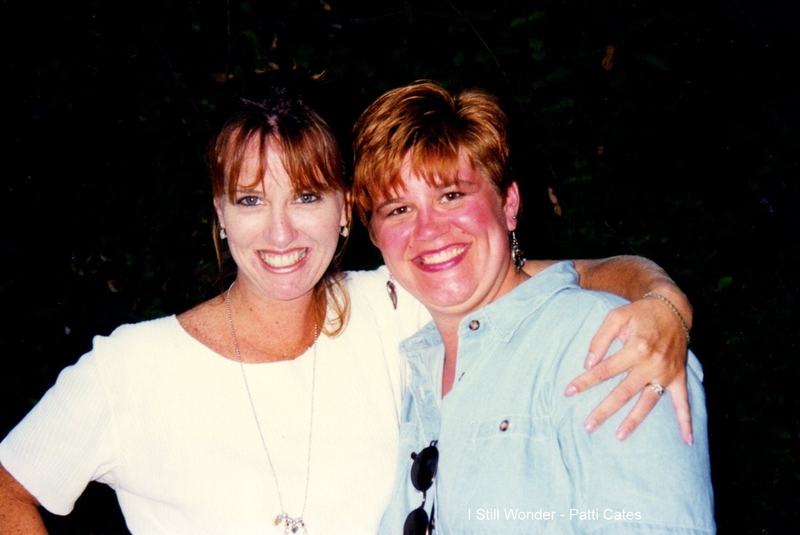 And, if you are on this journey, I’d love to hear from you so I can support you too. After all, we are in this together! Hi and Happy Friday! For today’s Flashback Friday, I chose a picture from the early 1980s. 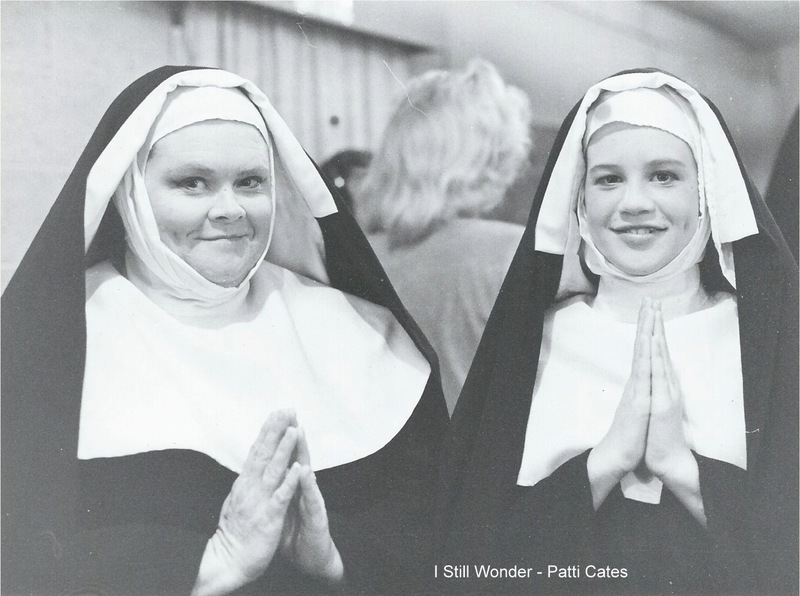 Mom and I are dressed as nuns for “The Sound of Music,” which was performed at our community theater. We were in the chorus of singing nuns and my sister played Marta. It was such a fun show. In this picture, I love the expression of our eyes, our smiles, dimples, and the praying hands. We did have a great time. Throughout my childhood, I was in plays and musicals and loved every minute of them. Our community theater produced great shows with amateur actors, singers, and dancers. There also was a Junior Playhouse for kids. We spent quite a few summers there. Some of the shows that we did were “J.B.” about the story of the book of Job in the Bible, “The Emperor’s New Clothes,” “Barnum,” “The Sound of Music,” “Hello Dolly,” and others that I don’t remember. It has been a long time since I have been on the stage. I miss the fun and camaraderie that the cast has. And, since I love to sing, it was fun to have that chance. Long days and many hours were spent in the community theater and my high school theater. We went with Ian’s Cub Scout Den this Monday on a tour of the square where the community theater was and still is. It was fun to see that building again and it brought back a lot of great memories. During the summers of junior playhouse, we would walk down to the local pharmacy for snacks and ice cream. That pharmacy is no longer there. That building was converted into a restaurant. The food is good but I miss the pharmacy. I also love to see musicals and plays. Two years ago, we took Ian to see Peter Pan and he loved it. It was an abbreviated production during the school day, but just right for him. I hope we will see more shows soon. We have a few friends who are professional actors and I love to see them in their particular genres. We also have friends who are actively involved in the theaters in their community. Theater to me was a fun hobby. I wonder when the next time will be that I am in a play or a musical? I am not sure but hope to be in a show again one day. On the 11th hour of the 11th day of the 11th month of 1918, an armistice went into effect and fighting ceased between the Allied Nations and Germany. World War I was then finished. It was called the war to end all wars. Thus Veterans Day was born. 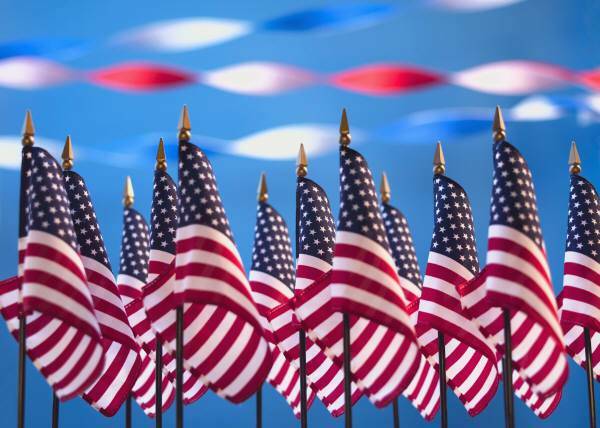 Happy Veterans Day to all of those amazing and brave men and women who serve our country. I want to say thank you to all of the men and women who have served in uniform or are still serving. You make it possible for me and my family to live and enjoy our freedoms promised by the U.S. Constitution. For that, I will always be grateful. 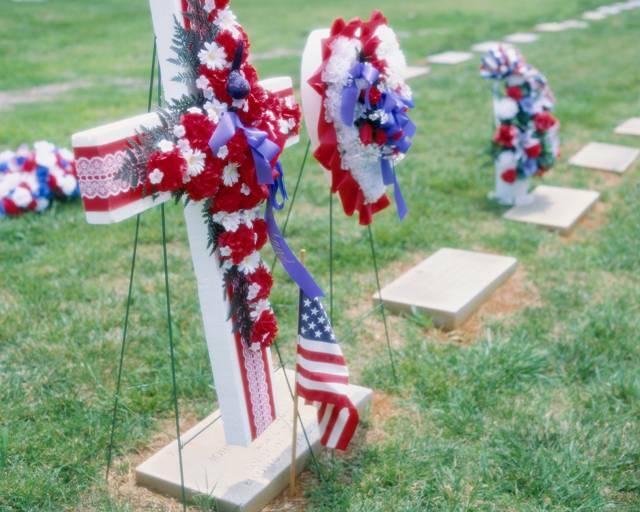 Not only are those being shipped away to be honored, but all the families who are left behind to carry on. I am in awe of those families who have a member deployed for one year. That is such a long time and so much happens. I feel for and pray for those families and hope everyone will return home safely again. Those in the service certainly know what true sacrifice is. Some give their lives, others give their health, their bodies, and their time. May we not take them for granted. I wonder if on this Veterans Day, I will truly understand and appreciate all the amazing things that our military men and women do for us? I plan to do just that and say thank you!